Sea Scouts is a youth maritime training program, and is part of the Boy Scouts of America. 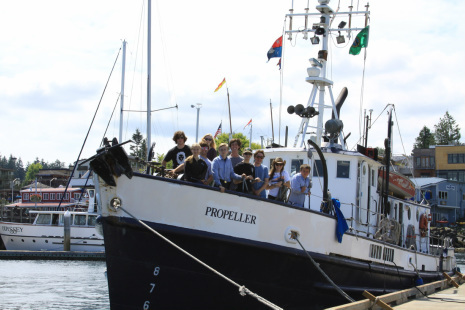 The crew on the SSS Propeller typically ranges from 12 – 20 Scouts, male and female, ages 14 to 21. We currently have 14 youth members. We operate the SSS Propeller year-round, meeting weekly and offering several weekend events each month. Our crew trains to run all aspects of the ship, including engineering, deck work, navigation and helm, and even working in the galley. During weekend cruises we live on board the boat and visit places around Puget Sound. In the summer, we take an extended cruise to the San Juan Islands and places further north. Included in our alumni are 2 captains for Holland America Lines, a USN Submarine Captain, Coast Guard commissioned and petty officers, Army pilots and mechanics, Chief Engineers aboard commercial freighters, business owners, electrical engineers, many deckhands and AB Seamen, and the list goes on and on. Many alumni come back to the program and volunteer, often stating a desire to give back to the program they received so much from.